Yes, Are you looking for a unique venue for your next corporate function or company outing? Well, my friends, look no further, as you have stumbled upon the unique-is thing in all of San Francisco (and the surrounding Bay Area counties). 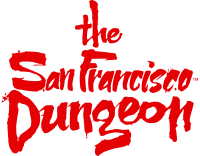 Between our live theatrical actors, 360º themed rooms, scents, special effects, and more, The San Francisco Dungeon is sure to keep your coworkers raving about the greatest company party or outing their eyes have ever seen. And, it's all thanks to you! We'd love to talk to you about customizing our location to fit the needs of your event! For more information CLICK HERE!